Background: The use of imaging techniques is important for prompt diagnosis and treatment of atypical mycobacterial infections; it also reduces the burden of these infections. The purpose of the present study was to determine the association between computed tomography (CT) scan findings of pulmonary infection caused by atypical mycobacteria and bacillus count in sputum samples. Methods: This cross-sectional, observational, comparative study included 50 consecutive patients with pulmonary infection caused by atypical mycobacteria, who were hospitalized in Masih-Daneshvari Hospital of Tehran, Iran during 2012–2017. The association between CT scan findings of pulmonary infection caused by atypical mycobacteria and bacillus count in sputum samples was determined in these patients. 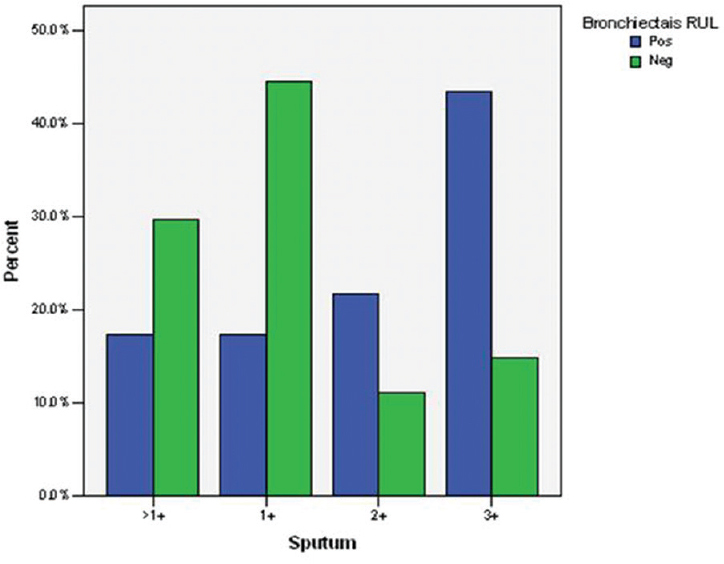 Results: The results demonstrated that the presence of nodules smaller than 5 mm in diameter, consolidation, bronchiectasis, and pleural thickening were related to bacillus count in sputum samples (P < 0.05). Conclusion: Some CT scan findings, such as nodule diameter smaller than 5 mm, consolidation, bronchiectasis, and pleural thickening, may be indicators of atypical mycobacterial infection. Increased number of involved lobes with bronchiectasis can promote early diagnosis in patients with higher smear and culture grading. The prevalence of atypical mycobacterial infections has shown an increasing trend over the years.,,,,, Accordingly, prompt diagnosis and treatment can reduce the burden of these infections and improve prognosis., The best available methods for determining the severity of atypical mycobacterial infection of the lung and its transmission rate are sputum analysis and culture studies; nevertheless, these methods are time-consuming and costly. There are multiple abnormal findings in chest computed tomography (CT) scan in patients with atypical mycobacterial infections. The association of positive sputum or culture results with CT scan findings in atypical mycobacterial infections can be useful for early diagnosis and prevention of diseases transmission. In addition, by determining the severity and extent of infection, it can help select the appropriate therapeutic approaches, which are more cost-effective and less time-consuming than other methods.,,,,,,,,,, The purpose of the present study was to assess the association between CT scan findings of pulmonary infection caused by atypical mycobacteria and bacillus count in sputum samples. In this cross-sectional, observational, comparative study, 50 consecutive patients with pulmonary infection caused by atypical mycobacteria, who were admitted to Masih-Daneshvari Hospital, Tehran, Iran (2012–2017), were selected. Data were collected using a checklist. The inclusion criteria were as follows: (1) atypical mycobacterium infection based on positive sputum analysis or culture results, (2) availability of CT scan images, and (3) presence of sputum analyses. The exclusion criteria were immunodeficiency, history of treatment, a time gap of more than 15 days between CT scan and sputum analysis and presence of concomitant pulmonary diseases affecting CT scan results. Chest CT scan was carried out in the supine position in deep respiration from lung apices to the lung bases (2-mm collimation at 10 mm intervals) with scan parameters of 120 kvp3, 200 mA, and scan duration of 3 s.
The association between CT scan findings of pulmonary infection caused by atypical mycobacteria and bacillus count on sputum samples was examined. 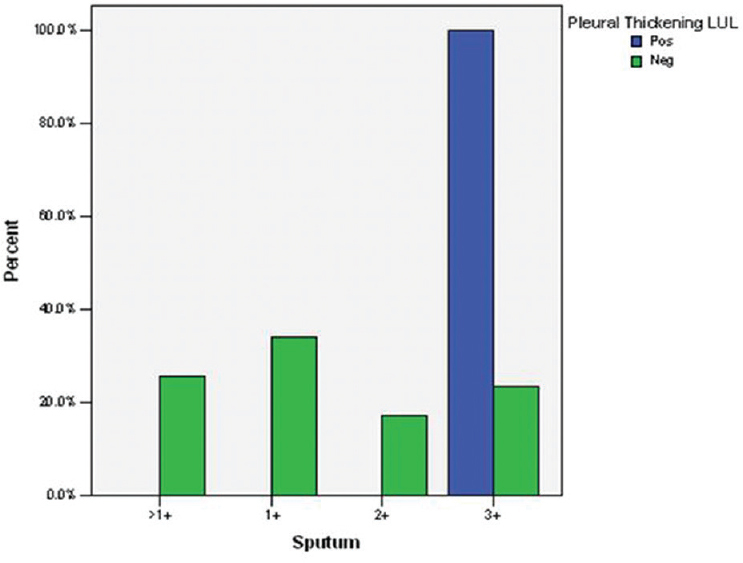 The grading of sputum culture and analysis is described in [Table 1] and [Table 2]. Data analysis was performed using Chi-square and ANOVA tests in SPSS (version 24.0) software [Statistical Procedures for Social Sciences; Chicago, Illinois, USA]. P < 0.05 was considered statistically significant. Among 50 patients, the results of smear grading were as follows: smear grade <1+ (n, 12); smear 1+ (n, 16); smear 2+ (n, 8); and smear 3+ (n, 14). The most common species included Mycobacterium simiae, Mycobacterium chelonae, Mycobacterium kansasii, Mycobacterium intracellulare, Mycobacterium avium, Mycobacterium abscessus, and Mycobacterium branderi (n, 21, 9, 7, 6, 4, 2, and 1, respectively). The most common CT scan finding was nodule diameter <5 mm, while the most uncommon findings were pneumothorax and pleural effusion. In subjects with smear 3+, nodule diameter smaller than 5 mm and bronchiectasis were the most common findings. In addition, the mean number of involved lobes with bronchiectasis and consolidation, in smear 3+ patients was increased. The most uncommon findings in smear 3+ patients were pneumothorax and pleural effusion [Figure 1]. Patients with nodule diameter <5 mm in the right lung had significantly higher rates of smear 1+, 2+, and 3+ (P = 0.010) [Figure 2]. The frequency of smear 3+ was significantly higher in patients with bronchiectasis the right lung (P = 0.043). The frequency of smear 3+ was significantly higher in patients with pleural thickening in the left lung (P = 0.038). In addition, the culture results showed a greater cavity diameter in 3+ and 4+ patients (P = 0.001) [Figure 3]. The purpose of this study was to determine the association between CT scan findings of pulmonary infection caused by atypical mycobacteria and bacillus count in sputum samples. The results demonstrated that nodule diameter smaller than 5 mm in the right lung, right lung bronchiectasis, and pleural thickening in the left lung were related to sputum sample analysis and culture data. The increased number of involved lobes with bronchiectasis and pleural thickening can result in the prompt diagnosis of patients with higher smear and culture grading. In this regard, a cross-sectional study by Moore on 40 patients revealed that CT scan findings in smear-positive cases included bronchiectasis, nodular lesions, and inferior lobe involvement, similar to our study. In addition, Marras et al. in 2013 reported that among 70 patients with pulmonary infection caused by atypical mycobacteria, 88%, 63%, and 50% had nodules, cavities, and bronchiectasis in CT scan, respectively; however, the rates were lower in our study, possibly due to some methodological differences. In addition, a study by Lee et al. showed that among 369 patients with and without immunodeficiency, bronchiectasis, ill-defined nodules, and opacity were the most common findings in both groups. Based on the results, nodules with cavity and opacity larger than 2 cm were more common in patients with immunodeficiency. Moreover, Bolursaz et al. in a study on 95 patients with Mycobacterium tuberculosis revealed a significant association between positive smear and upper lobe nodule and cavity in CT scans, while lobar collapse and lymphadenopathy were related to negative smears. Similar results were reported in atypical mycobacterial cases in our study regarding the cavity and nodule. The most common finding of the present study was nodule diameter <5 mm, followed by bronchiectasis; these findings can help diagnose pulmonary infections caused by atypical mycobacteria more effectively. In addition, increased the involvement of lobes with bronchiectasis can improve prompt diagnosis in patients with higher smear and culture grading. Nevertheless, further studies with a larger sample size can provide more evidence to substantiate the findings. Shojaei H, Heidarieh P, Hashemi A, Feizabadi MM, Daei Naser A. Species identification of neglected nontuberculous mycobacteria in a developing country. Jpn J Infect Dis 2011;64:265-71. Ryu YJ, Koh WJ, Daley CL. Diagnosis and treatment of nontuberculous mycobacterial lung disease: Clinicians' perspectives. Tuberc Respir Dis (Seoul) 2016;79:74-84. Koh WJ. Nontuberculous mycobacteria-overview. Microbiol Spectr 2017;5. doi: 10.1128/microbiolspec.TNMI7-0024-2016. Martínez González S, Cano Cortés A, Sota Yoldi LA, García García JM, Alba Álvarez LM, Palacios Gutiérrez JJ, et al. Non-tuberculous mycobacteria. An emerging threat? Arch Bronconeumol 2017;53:554-60. Donohue MJ. Increasing nontuberculous mycobacteria reporting rates and species diversity identified in clinical laboratory reports. BMC Infect Dis 2018;18:163. Namkoong H, Kurashima A, Morimoto K, Hoshino Y, Hasegawa N, Ato M, et al. Epidemiology of pulmonary nontuberculous mycobacterial disease, Japan. Emerg Infect Dis 2016;22:1116-7. Martín-Casabona N, Bahrmand AR, Bennedsen J, Thomsen VO, Curcio M, Fauville-Dufaux M, et al. 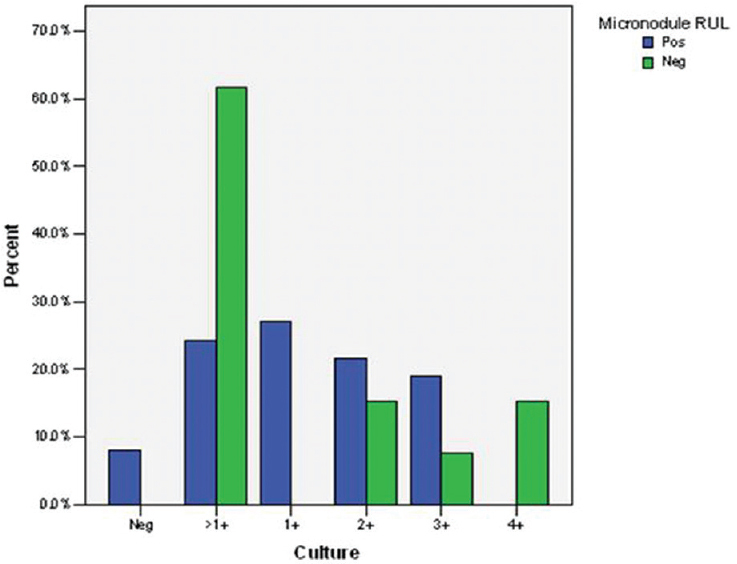 Non-tuberculous mycobacteria: Patterns of isolation. A multi-country retrospective survey. Int J Tuberc Lung Dis 2004;8:1186-93. Tortoli E, Rogasi PG, Fantoni E, Beltrami C, De Francisci A, Mariottini A, et al. Infection due to a novel Mycobacterium, mimicking multidrug-resistant Mycobacterium tuberculosis. Clin Microbiol Infect 2010;16:1130-4. Katoch VM. Infections due to non-tuberculous mycobacteria (NTM). Indian J Med Res 2004;120:290-304. Al-Mahruqi SH, van-Ingen J, Al-Busaidy S, Boeree MJ, Al-Zadjali S, Patel A, et al. Clinical relevance of nontuberculous mycobacteria, oman. Emerg Infect Dis 2009;15:292-4. Johnson MM, Odell JA. Nontuberculous mycobacterial pulmonary infections. J Thorac Dis 2014;6:210-20. Chaudhuri S, Sarkar D, Mukerji R. Diagnosis and management of atypical mycobacterial infection after laparoscopic surgery. Indian J Surg 2010;72:438-42. Dünne AA, Kim-Berger HS, Zimmermann S, Moll R, Lippert BM, Werner JA, et al. Atypical mycobacterial tuberculosis – A diagnostic and therapeutic dilemma? Case reports and review of the literature. Otolaryngol Pol 2003;57:17-23. Thavagnanam S, McLoughlin LM, Hill C, Jackson PT. Atypical mycobacterial infections in children: The case for early diagnosis. Ulster Med J 2006;75:192-4. Lee Y, Song JW, Chae EJ, Lee HJ, Lee CW, Do KH, et al. CT findings of pulmonary non-tuberculous mycobacterial infection in non-AIDS immunocompromised patients: A case-controlled comparison with immunocompetent patients. Br J Radiol 2013;86:20120209. Moore EH. Atypical mycobacterial infection in the lung: CT appearance. Radiology 1993;187:777-82. Marras TK, Wagnetz U, Jamieson FB, Patsios DA. Chest computed tomography predicts microbiological burden and symptoms in pulmonary Mycobacterium xenopi. Respirology 2013;18:92-101. Mirant-Borde MC, Alvarez S, Johnson MM. Mycobacterium interjectum lung infection. Case Rep Pulmonol 2013;2013:193830. Mirsaeidi M, Hadid W, Ericsoussi B, Rodgers D, Sadikot RT. Non-tuberculous mycobacterial disease is common in patients with non-cystic fibrosis bronchiectasis. Int J Infect Dis 2013;17:e1000-4. Ahmed I, Jabeen K, Hasan R. Identification of non-tuberculous mycobacteria isolated from clinical specimens at a tertiary care hospital: A cross-sectional study. BMC Infect Dis 2013;13:493. Bolursaz MR, Mehrian P, Aghahosseini F, Lotfian F, Khalilzadeh S, Baghaie N, et al. Evaluation of the relationship between smear positivity and high-resolution CT findings in children with pulmonary tuberculosis. Pol J Radiol 2014;79:120-5.